Last Wednesday, four of us went to Genting Highlands at about 1am after supper. It was David's off day and he insisted on going there to donate money try his luck. While waiting for him, we just walked around, knowing the fact that there's nothing to see. Nobody there except the three of us. "Don't look at the camera. Look there. There's a pretty girl over there." Wai Hong said. See what happened to the picture when the KL Tower a super-tall guy holds the camera. "Forget it guys." It is closed. Since we had no choice, we entered Curry House, one of the only restaurants still open for business. mybb ordered Roti Planta but they served him Roti Canai! The waiter said, "Because you Singaporean called it Roti Prata instead of Roti Canai." "Prata? What is Prata?" I asked mybb. We told him we are NOT Singaporean and we said PLAN-ta. NOT PRA-ta. Roti Telur Bawang (RM 4.00++) and a can of Sprite (RM3.50++). 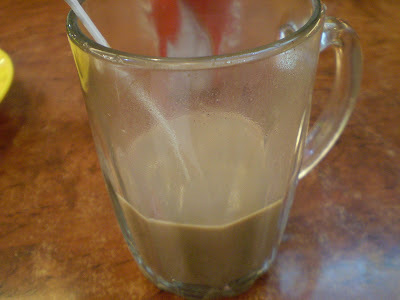 Milo (RM 5.00++). ? Me too. Roti Planta (RM 4.00++) and a can of Coke (RM 3.50++). Within one hour, David has finished playing. I didn't expect him to be this fast. Your visit is not complete if you don't throw a coin and make a wish. "Yeah right!" On the way back, I heard David said, "I can reach downhill within 15 minutes." He drove so fast; accelerated around those sharp corners and overtook other cars ahead as if the car does not have a brake pedal he is the main actor in Initial D! mybb and Wai Hong were so . Imagine we were like riding a roller coaster, left to right, right to left. We almost heard "Welcome to the sweet heaven." *touch wood*! "I'm not ready to meet my grandparents yet!" I couldn't stand it anymore!!! What happened next? I rather go and eat in the hotel's coffee shop in Genting. The mamak is overpriced. Indeed. Anyway, first and last time for me. RM4.00 for a roti telur bawang? Just what kind of bawang do they put in there? LOL! hahaha...and also what kind of eggs they used? !